Don’t forget to return your sponsorship money to us as soon as you can. We have received over €20,000 to date! Well done to all our participants who took the time and effort to fundraise and take part in this year’s VHI Women’s Mini Marathon. Everyone who returns their money by July 31st is entered into a draw, and the person who returns the most money by that date will win a fabulous prize of one night B&B in the luxury 5 star Castlemartyr Resort. We have been hearing from some of our amazing participants who have returned sponsorship so far. Patricia Hardiman, patient at St. James’s Hospital, tells us why she ran to support her hospital. Patricia collected her 20th Women’s Mini Marathon medal this year. 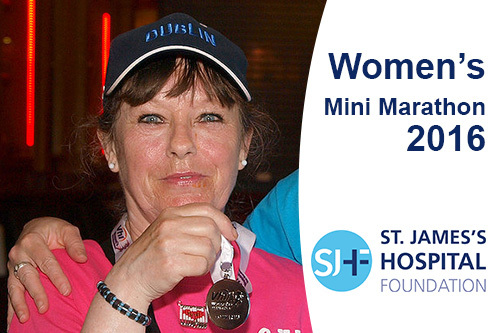 “I’ve been taking part in the Women’s Mini Marathon for a long time and have ran for St James’s Hospital since 2010. I do a lot of dancing, in particular, Irish dancing. Last year I fell and badly hurt myself, I thought I had lost my hand. St James’s is my hospital, so I insisted that I went there for treatment. Thankfully it was only a broken wrist, but the loss of being able to use your hand is so horrific. The staff in the hospital couldn’t do enough for me. I’ll always remember how they had to cut the sleeve off my top, but they were incredible. I had to get x-rays and physio, and the physiotherapist staff were wonderful. Many thanks to Patricia and to all our amazing supporters who took part this year.